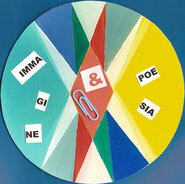 IMMAGINE & POESIA (Anthology) Vol. 3 - immaginepoesias JimdoPage! Our deep gratitude to the Poets and Artists who have sent their contributions from different geographical areas and different cultural backgrounds, showing that Art and Poetry can open a way to Beauty and to Peace. Special thanks go to Lawrence Ferlinghetti, icon of the Beat Generation, and to Agneta Falk Hirschman who have joined the 2016 edition of Immagine & Poesia E Book. The Pdf format of this anthology has been created by Huguette Bertrand, Canadian representative for Immagine & Poesia Movement. Le format Pdf de cette anthologie a été réalisé par Huguette Bertrand, représentante canadienne du Mouvement Immagine & Poesia.